Waterproofing is essential to maximizing the durability and longevity of any building private or commercial. Therefore the use of right waterproofing system is vital to preserve building envelope from water penetrating. Want to transform your wet, moisture and musty basement into beautiful and usable space, you must have to install right waterproofing solution. Waterproofing system for new or existing building can develop on two techniques; Positive side waterproofing and negative side waterproofing. Positive Side Waterproofing:The Positive side waterproofing refers to the direct exposure of water designed to prevent water enter into structure and cause damages. Positive side waterproofing is typically considering most effective solution. 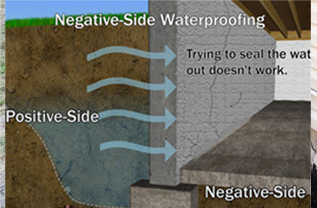 Negative side Waterproofing:This applies to the opposite side of water direct contacts. It means negative side waterproofing layers used interior side of the structure. Typically used for remedial work. Which basement waterproofing repair system you should install? It’s all depends up unique construction structure and foundation system of your house or building. Tetra Construction is the leading Waterproofing Contractors in Brooklyn NY specialized in all types of waterproofing system installation, repairs and maintenance work. Extend the life span of your building structure with effective basement waterproofing system. Give us a call and get Free Estimate.